My childhood memories of succotash are not good. I distinctly remember dumping my bowl of succotash in the bushes during an evening picnic when I was around six years old because the mushy tasteless succotash (likely canned) was standing between me and dessert. I discreetly dumped it in the bushes when no one was looking and innocently asked for dessert. The dish that I couldn’t stomach way back when is a far cry from the hip and delicious take on succotash I served for dinner tonight. Succotash is Narragansett (an extinct Algonquian language) for “broken corn kernels” and is traditionally made with corn and lima beans. These days, creative chefs have expanded the definition and have made a vegetable dish that is easy and versatile. Corn is still the star, but you can be really inventive by cooking corn with whatever vegetables you have in the freezer, in the refrigerator (great use of left over vegetable), or in the garden (we have a few more month for this to be an option). Tonight I pulled some garden corn and peas from the freezer when I got home from work, added some onions and herbs, and had an easy side dish in less than 20 minutes. There is nothing like a sweet summer succotash made with corn just off the cob with it’s sweet sugar milk (this is a great use of leftover corn on the cob!) and an assortment of fresh veggies (zucchini, summer squash, broccoli, cauliflower, peas, etc.). This is an easy, healthy, and light side. I long for the days of walking out to the garden and picking dinner, but on this snowy January night cooking up some frozen and stored veggies made for a taste of summer on this cold evening. Defrost any frozen veggies, steam/boil any fresh veggies. Melt the butter in a pan, cook onions until translucent, about 5 minutes. Add vegetables and herbs and cook for 5-10 minutes and serve. Below is a photo of a summer succotash I made last summer with fresh from the garden corn (off the cob), shell peas, sweet onion, and fresh herbs… yum! We kicked off the expansion of Farm Fresh Connect, our local, online farmers market, to the communities of Pittsford and Chittenden last week. We’re pumped to make local food more accessible in these two Vermont towns, both of which have limited shopping opportunities – particularly for locally grown and produced food. While the pickup of market orders happens at elementary schools in both towns, anyone in either community – whether they work or live nearby – is open to shopping on Farm Fresh Connect. As part of the promotion of Farm Fresh Connect, at Wednesday pick ups between 3 & 5pm, we’re offering tastings of dishes made with items found on the market. Last week, it was this simple corn and bacon sauté. Sweet corn and smoky bacon are just meant to be paired together, which is why I love to start a pot of corn chowder with the fat left behind after cooking bacon. I add in a little zucchini and jalapeno, if inclined, but almost always include basil. Thyme would work nicely as well. The result is an excellent side dish for encapsulating the fleeting tastes of summer, though I’ve had a whole bowl as my entire dinner, too. Hope to see you at one of our market pick-ups! Chop the bacon into a small dice. 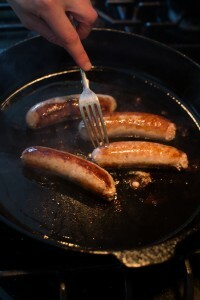 In a pan over medium high heat, cook the bacon until crisp, watching closely to avoid burning. When crisp, use a slotted spoon to remove from the pan and set aside on a paper towel lined plate. Remove the pan from the heat. Slice the kernels off the corn cobs. A good way to do this is to invert a small bowl inside of a larger bowl and stand the cob on the small bowl. As you slice, the kernels will fall into the large bowl. Then, chop the onion and zucchini into a small dice. If using the jalapeno, remove the seeds and chop as well. Return the pan with the bacon grease to the heat and add the corn, onion, zucchini and optional jalapeno. Cook 8-10 minutes until the pan is dry and vegetables tender. Thank you for joining us on our second installment of the Eat Your Freezer Clean challenge! By treating our freezer like an organized and important tool in our kitchen, not only can we feed ourselves and loved ones with wholesome, nourishing meals, but we will save time, money and reduce waste. It is (finally!) spring in the Upper Valley and the opening day of the season’s outdoor farmers’ market is weeks away. While we wait in anticipation of all the good things that warmer weather will give us, let’s take a closer look at the vegetables you saved from last year; a teaser to the variety we can all look forward to in the summer and fall months. Recipes abound on the internet on how to use your frozen vegetables, so below we gathered a few of our personal favorites and inspirations that are quick, easy and flexible. 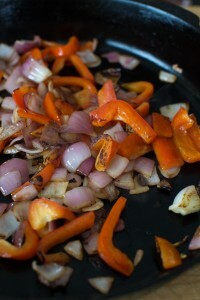 Quick and Easy Pan Roasted Side Dish– Choose a large skillet with a lid. Heat the skillet over medium heat, add a teaspoon or two of olive oil. When the oil begins to shimmer (takes several seconds) and slips around easily in the pan, but isn’t smoking, throw in a cup or two of frozen corn and quickly stir to coat with oil. Cover the pan and shake the corn over the heat occasionally, letting the corn steam for a few minutes. Uncover and continue to stir while the corn softens, browns and slightly carmelizes. Season to taste with salt, pepper and a pinch of red chili flakes. I like to drizzle a bit of maple syrup on top when eating as a side dish with savory meats. Use in Soups, Chilis and Stews – Add a cup of corn to a pot of simmering soup, chili or stew during the last few minutes of cooking. Top with any fresh herbs you might have on hand or might be getting leggy in the window, parsley or cilantro being two readily available favorites. Salad – Thaw frozen corn overnight in the refrigerator and drain in a colander. Because corn is blanched before frozen, it is just toothsome enough after thawing that it pairs wonderfully in a crisp salad. Try topping chopped romaine with black beans, thawed corn, your favorite salsa and chopped cilantro. Thaw, Drain, Dry – This method applies to all sorts of greens, but is especially useful with spinach as the leaves tend to retain a lot of moisture. Thaw your greens and drain in a colander. Using a clean dish towel with a tight weave, gather a large handful and wrap in the towel, twisting and squeezing out the water. OR just use your bare hands, as I tend to do because I hate to do more laundry than I need to. Or better yet, click on over to The Kitchn and give this ingenious tip a try, especially if you have a potato ricer gathering dust in your drawer. Green Smoothie – This works best with small frozen chunks, rather than large or thawed greens, but if you have ice cube sized frozen greens, try throwing a few in a blender with a bit of your favorite liquid (dairy or dairy-free milk, juice or even a bit of water), some fruit (I like to use frozen apples or fresh past their prime, frozen bananas or berries) and a tablespoon of nut butter. Give it a whirl, sweeten with honey or maple syrup if you need to and you have yourself a tasty, healthy treat! Use in Soups, Chilis and Stews – Throw frozen greens into a simmering pot either a two or three minutes or several minutes before (if they are LARGE chunks) your favorite ladle-friendly meal is done cooking. Easy, delicious, healthy. We like that. Casseroles – There is nothing tastier than a comforting, warm casserole on a cool spring day. Frozen potatoes can be thrown into any egg or potato based casserole of your choosing. For a nutritious and filling one dish meal, toss frozen potato cubes (or shred), frozen greens, frozen corn and fresh or frozen onions with a glug of olive oil, salt and pepper. Put in a casserole dish and pour on a bowl full of eggs beaten with a bit of flour and milk. Dollop with ricotta cheese and bake in a 350 degree oven until puffed and lightly brown or about 25 to 35 minutes depending on the size of your dish. Soups, Chilis and Stews – Are you beginning to see a pattern here? Frozen potato cubes can be thrown into any ladle-friendly meal about 15 minutes or so before it is finished simmering. You can also make a quick potato soup by covering two cups of frozen potatoes with your favorite salted/seasoned broth and simmering until tender and either pureeing for a silky bisque-like soup or keep it chunky and throw in other quick cooking veggies or leftover cooked meat. Get Ethnic! 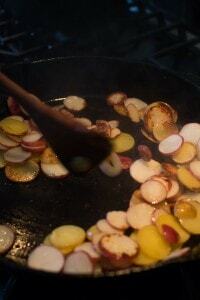 – Many cuisines use potatoes and two of my favorite are Indian curries and the delicious Spanish tortilla. Use care when cooking any frozen potatoes in oil and use the moisture they release to help cook them further by covering or partially covering the pan with a lid. Zucchini – add to ladle-friendly meals or thaw, drain and dry like you would frozen greens and add to muffins, cake, bread or saute in bit of butter and chopped onions until tender for a delicious side dish. Peas – beside the usual steaming or throwing into macaroni and cheese, try making soup! Here is a link to my absolute favorite recipe for fresh pea soup. And it is JUST as delicious and beautiful if you do not puree it. Winter Squash – Boil until tender, mash with a fork or whisk and serve as a side dish with a touch of salt and butter. Also try it in pancakes, make a silky coconut milk bisque or substitute the sweet potato in this delicious southern recipe for cake. Mixed Veggies – Use for stir-fry, fried rice, ladle-friendly meals or bake into a vegetable lasagna or make pasta primavera. It is that easy.